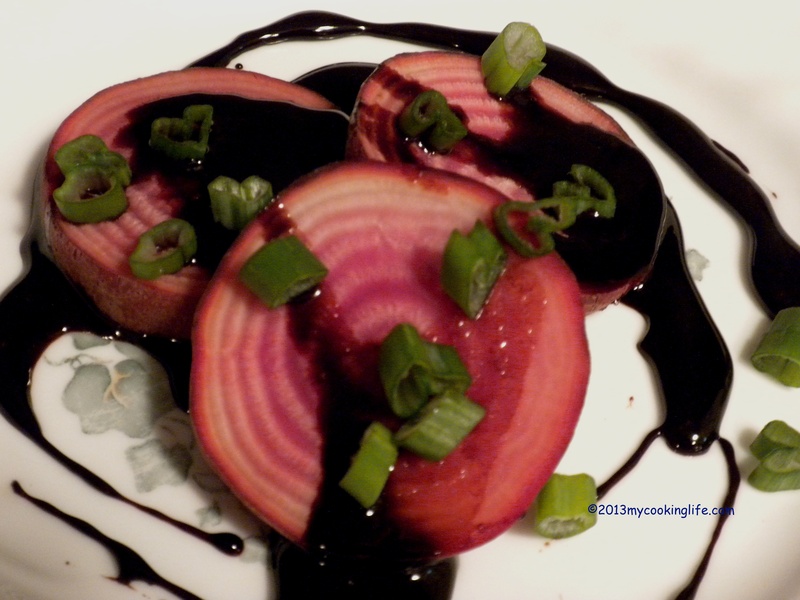 It’s been “Beet Week” around here at My Cooking Life and it’s coming to a close. That’s because I bought exactly three beets and made a commitment to try them three different ways despite the fact that I have never ever liked beets before. I invited the always entertaining Tom Hanks to come over and coach me, I’m sure I kept you spellbound with the harrowing beet enforcement incident of my childhood, and we tuned in the unforgetable comedy and musical talent of Weird Al and Michael Jackson. I even risked eating raw beet salad and ventured into creating my own gourmet roasted beet salad. But now it’s time to get totally un-serious. What is the one ingredient that makes everything else taste much better? The one that changes our outlook on life and gives us the spiritual boost we need? What is the one thing that can and does make eating nearly any food a sensual, delectible experience? It’s chocolate of course! And after all, it makes total sense that I would come up with a chocolate-themed beet recipe, does it not? I created this recipe the way I do most of mine—I thought it up and then went to the kitchen and made it. I felt quite “saucy” doing this and hence the name of the dish! 1/4 cup aged dark balsamic vinegar (I used expresso flavored balsamic but you could add a shot of strong espresso to well-aged dark balsamic. This wonderful bamboo steamer has a lid, of course, except when I’m taking a picture of the contents! In a small sauce pan, combine the balsamic vinegar, espresso, barley malt, cocoa powder and salt. 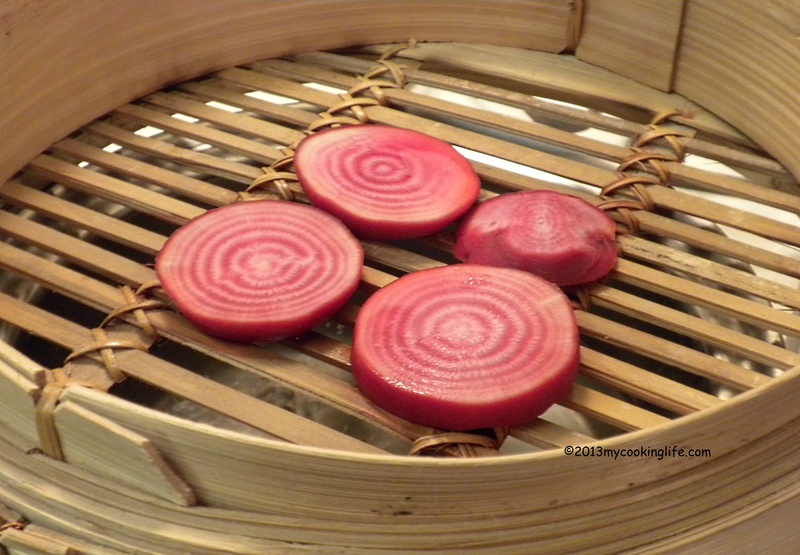 When the beets were done steaming I removed them and put my pan over the steam heat. I heated the sauce until it was well combined and heated but not boiling (chocolate does not taste good burned or over-cooked!) The sauce will thicken as you stir. Add a pinch or two of cayenne pepper. Serve the steamed beets with this lovely sauce over it. Yes! When in doubt, add chocolate! Even beets taste okay with Savory Chocolate Insoucience! I finished the beets on my plate and then ate all the sauce from the plate and the sauce pan. A hint of cayenne makes the sauce extra-insouciant. This entry was posted in Chocolate, Recipes, Vegetables and tagged Balsamic vinegar, beets, cheeky chocolate, Chocolate, savory chocolate sauce, steamed vegetables by mycookinglifebypatty. Bookmark the permalink. This is a brilliant idea. I like Mexican mole sauces and so am completely at home with using chocolate in savory dishes. Great post. Thank you! Considering how much I loathe beets, this combo was quite good. I was hesitant to press the “like” button as my mind snapped closed at the words “beet” and “chocolate” together. (Am drinking hot chocolate right now–something I hardly ever do!) However, a mind is not meant to be closed. Will try to pry this one open again. Like your commenter above said, this is borderline genius. At least wildly creative! Thanks Kathy! I admit I was proud of this one and I was able to eat all my beets with this sauce. I’ve been thinking this sauce would be fabulous on baked whole cauliflower too! I think this is borderline genius. And it may well be the only time anyone has thought of pairing beets with chocolate. Ah-may-zing. Thanks so much! You’re probably right about beets and chocolate! You’ve got me with this post. Now I’ve got to eat beets! The dressing itself is truly inspiring. Thanks! The sauce was indeed a success! Please let us know how yours turns out!